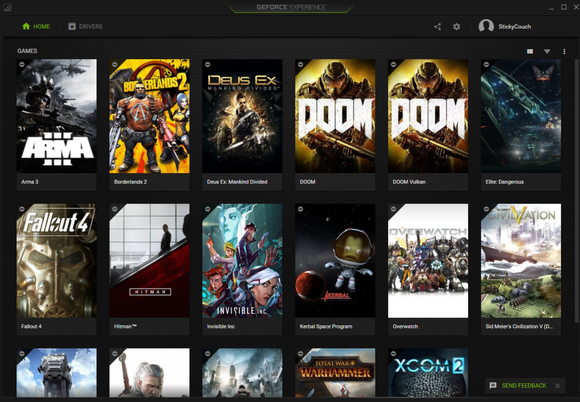 But you can still download Game Ready drivers directly from Nvidia's website without registering. Between the PlayStation 4 Pro reveal and all the iPhone news on Wednesday, Nvidia quietly rolled out a major upgrade of its own. 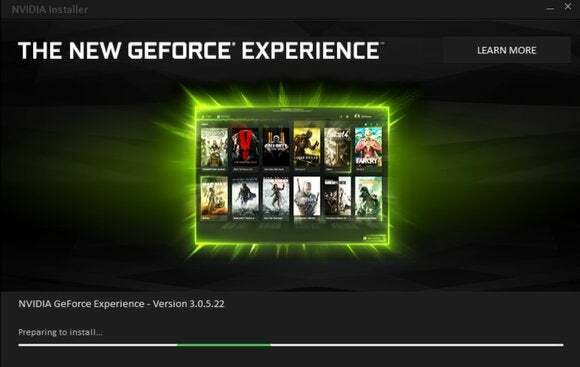 The company pushed out GeForce Experience 3.0 yesterday—a comprehensive redesign of the popular software found on “tens of millions” of GeForce graphics card-equipped PCs, but one sure to rile some nerves at the same time. Let’s start with the good stuff first. As you can see in the image below, the interface has been completely revamped, with a strong focus on your installed games. If you yearn for a more information-dense dashboard as opposed to the flashy art, switch from Tiles view to Details view. Switching over to the Drivers tab lets you know if your graphics card software is up to date, just like in the old GeForce Experience. 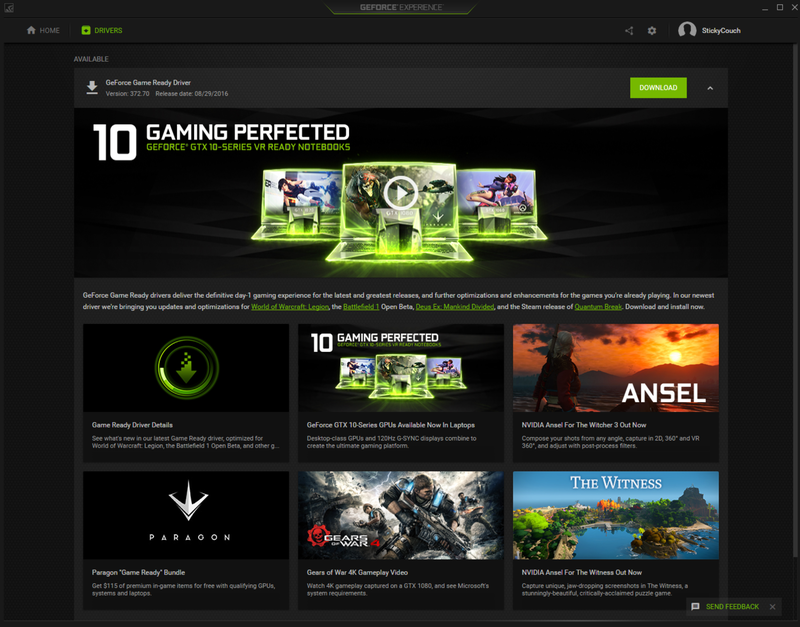 But in GeForce Experience 3.0, that banner’s followed by several tiles that display details about GeForce news and features, partner games, and more when clicked on. 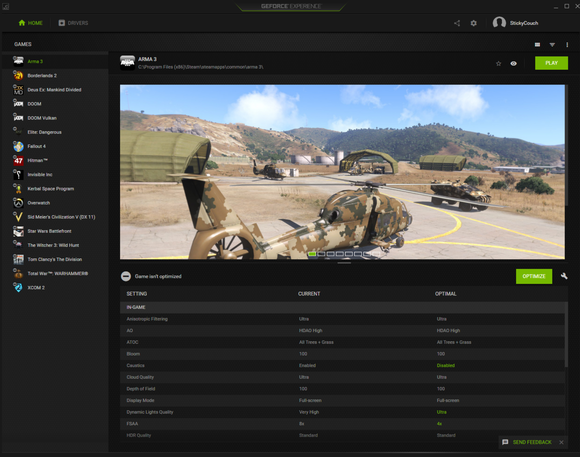 So where are the My Rig and ShadowPlay options from the older GeForce Experience? They’re still around, lurking in the two icons to the left of your name in the upper-right hand corner. You’ll find system details, the ability to connect Shield devices for GameStream, and much more inside the Settings menu, which is represented by a cog icon. The General section of the Settings dashboard lets you know what’s needed to run GameStream, GeForce Share, Game Optimization, and VR, and checks your PC’s configuration against the list—a handy touch. Meanwhile, if you don’t want to receive emails from Nvidia, you’ll find the option to disable them in the Account section. Overall, Nvidia says GFE3 is three times faster and consumes 50 percent less memory than the old GeForce Experience, and in practice, this puppy hums. 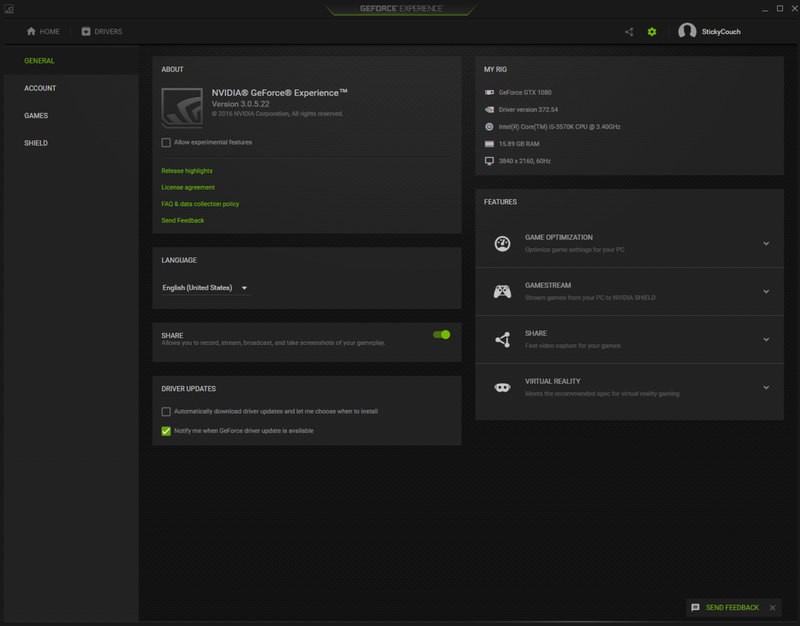 The older GeForce Experience had a microscopic lull when you switched between tabs that irked me to no end. GeForce Experience 3.0 is completely responsive and a joy to use. 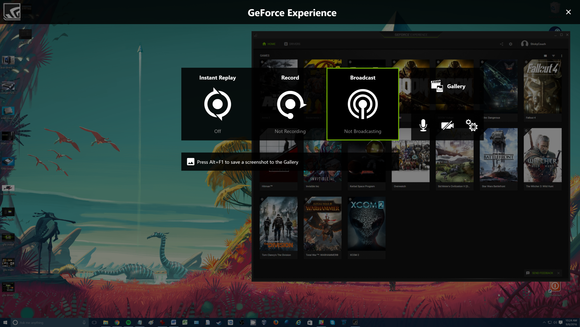 The automatic installation from the older GeForce Experience failed on my personal PC, but downloading GeForce Experience 3.0 from Nvidia’s website afterward fixed the issue. Now for the somewhat troublesome news. It’s not all bad, though. 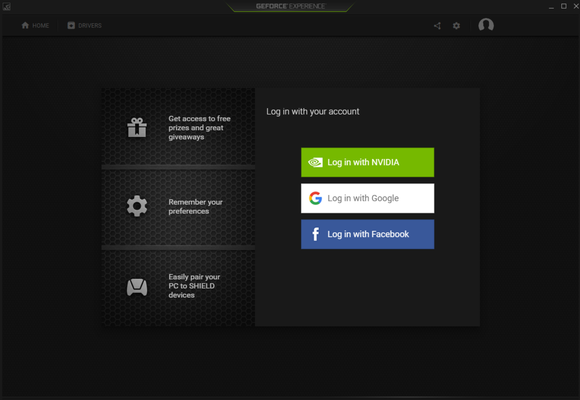 Nvidia’s also taking advantage of registration to integrate giveaways directly through GFE, starting with VR-ready MSI gaming laptops and the HTC Vive VR headset. One day, the free games that Nvidia sometimes bundles with its cards could even conceivably be delivered via GFE, similar to how Nvidia offered free Witcher 3 copies to Titan X owners last year, along with access to hot gaming beta tests. Game-based goodies like that would require you to log in to register, anyway—as they always have in the past.